My Grandpa died. There I said it on here. It has been over a week since he passed. He passed March 9th around 4am. He had been in ICU for over a week. He fought a long and hard battle with Emphysema (COPD). I haven’t absorbed it yet. We had the wake and funeral last week. A week ago tomorrow, actually. I haven’t cried as much as I thought I would. My mom is pretty upset. I think I have been trying to stay strong for her. Jack has kept me permanently distracted. A 2 year old is good for that. I have to say, he was an angel through all of this. He spent two days at the hospital with us all. He spent the weekend out and about making arrangements He spent two days at a wake and funeral. Missing his naps. We recevied tons of compliments on how well behaved our TWO year old is! Jack was perfect. Last night I couldn’t fall asleep right away because I started thinking about him. I didn’t cry. I thought about moments together. Like the summer I sat in the hospital with him for 12 hours a day while he recovered from a collapsed lung. I didn’t have summer school because I was transitioning between schools at the time. Heading off to Loyola in the fall. I was the only one who had that free time. We didn’t want him to be alone too much. I fed him. I made sure he drank water. I spoke to his doctors and nurses to relay any messages to my mom and aunts. I talked to him. Reminded him that in a year he had a wedding to be well for, mine! Mostly I sat there reading and napping while he slept. This was about 6 years ago. I started thinking about how proud he always was of me, Jason, and Jack. How he beamed over his GREAT grandson. Then I started thinking if I ever have another baby he will have no clue. Jack is the only great grandchild he would ever know. Even when my brothers and cousins have babies….. I eventually settled down. I am perplexed as to why I haven’t sobbed. It still feels unreal I suppose. I have to explain about my grandpa. He was a fighter. There were many times we received calls that he was doing poorly. Think back to that summer I described! Yet, he hung on for 6 more years. March 8th my mom called me early to tell me the hospital called her and my aunts in at 5am. Telling them his vitals dropped. When they arrived they said he had an hour to live. I was distraught. There was no way I could get there in time. I had been there Thursday night and the previous Sunday, but still! I wanted to be there. Jason was downtown, 30 miles away. Jack was fast asleep. Jason offered to come home but we figured by the time he got home Jack would be up anyway. I got to the hospital around 11. Grandpa had woken up in between the dr’s claims and my arrival. He spoke to everyone. He went back to sleep, but didn’t pass. As a matter of fact, he waited nearly another 24 hours to pass! Take that doctors! I had told Jason earlier on Thursday, “Grandpa is scrappy. This might not be the end at all.” I believed it. And even Jason pointed out “See, they gave him an hour and here we are hours later and he is still alive! He is scrappy!!! Don’t rush to the hospital!” I still rushed but Jason was right. My brother went on to tell me a story at the Wake. I may not relay it correctly but it went along these lines. He was telling his friend about how Grandpa always pulls through. After Thursday he said something similar to what I said, without us knowing it! He said, “He was supposed to die a long time ago. I don’t know that this is the end, he may pull through!” After he passed my brother used his humor to deal with it. He was again speaking to his friend. His friend asked about the services. Dan said something along the lines of “I don’t know, I still think he may pull through.” Initially his friend didn’t get it, but Dan explained he was building on his previous statement. It is true. Which is why I don’t think I have cried. I feel like I am still going to get that call from my mom “Grandpa is fine. They are releasing him. You don’t have to drive out here.” My Grandpa didn’t give up easily. I just feel like I am in this weird reality. It doesn’t make sense that he is gone. I cannot fathom it. I am not sure when it will hit me. I hope I don’t have a total public meltdown. A meltdown at home is fine though! 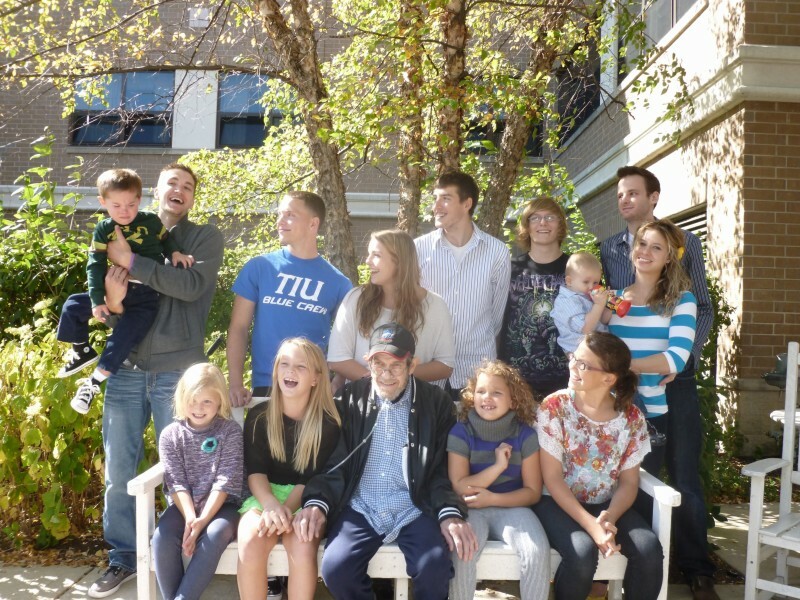 This past fall my grandpa asked me to arrange a photoshoot with him and all of this grandkids. I managed to pull it off. Getting us all in one place at one time. We are a wild bunch. This isn’t a perfect photo. Grandpa is smiling though. It is candid. We are all over the place. I actually printed an 11×14 poster of this. It is hanging near my kitchen/dining room. I love this photo so much. I will miss him. I will miss bringing him room sprays, per his request, and arguing that he doesn’t have to pay me back! He was on a fixed budget. I am not! I can afford a couple room sprays from Yankee Candle or Bath and Body Works. I am going to miss that. I have no one to buy them for now. Thank you for your kind words. He did worry about all his kids and grandkids. Before he passed my mom and aunts told him they would take care of each other and we would all be ok. We are a close family and will remain so. He was really suffering in the end so he is at peace now, which is what I try to remember. Maybe that is why I have been having not as hard of a time. I hated seeing him so frail.